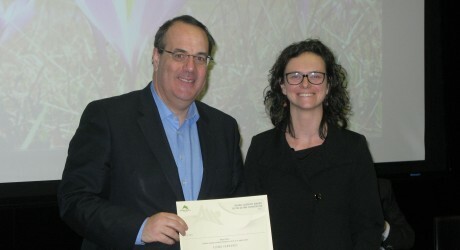 A GRADUATE from a Perth-based centre has won a prestigious award for her thesis. Elena Ferrario, a 33 year-old who studied at the Centre for Mountain Studies at Perth College UHI, part of the University of the Highlands and Islands, was awarded the Alpine Convention’s Young Scientist Award for her research into population trends in the Alps. She was presented with the award and a prize of €1,000 at the Convention’s Spring Festival in Italy this week. Elena, who grew up in a small village in the Italian Alps, says “mountains have always been her passion”. She decided to return to study after ten years of work so she could expand her knowledge of mountain areas. She took up a Master’s degree in sustainable mountain development with the University of the Highlands and Islands’ Centre for Mountain Studies so she could study online on a part-time basis and retain her job in France where she works on an EU-funded territorial co-operation programme. Elena’s thesis, entitled ‘Comelico staying or leaving – reasons to return to an Alpine valley’, investigated the factors which influence young mountain people to return to their valleys of origin after they left to complete higher education studies. The research also looked into policies and instruments which may attract residents to mountain areas. Elena found that job opportunities, quality of life and sense of belonging are the main reasons young people decide to return the mountains. It is hoped the results will help to inform policy in the Alpine region and could be relevant to similar regions across Europe. Says a spokesperson: “The Alpine Convention is an international treaty among the Alpine countries and European Union which aims to promote sustainable development in the Alpine area and respect, preserve and promote its natural environment and the interests of the people living within it. Speaking about her award, Elena said: “The role of young generations and the importance of the presence of qualified human capital is high on the agenda of the institutions and think-tanks for mountain development in Europe. Director of the Centre for Mountain Studies, Professor Martin Price, said: “I am very proud that one of our students has gained this prestigious award. “There is already great interest in Elena’s research among the people living in the area she studied and I believe that the results of her research will be very valuable across the Alps. Regula Imhof, vice-secretary general of the Alpine Convention, added: “Young scientists often have fresh views on issues that are relevant for the implementation of the Alpine Convention.